Still taking orders by phone or email? It's about time to switch to B2B WAVE! 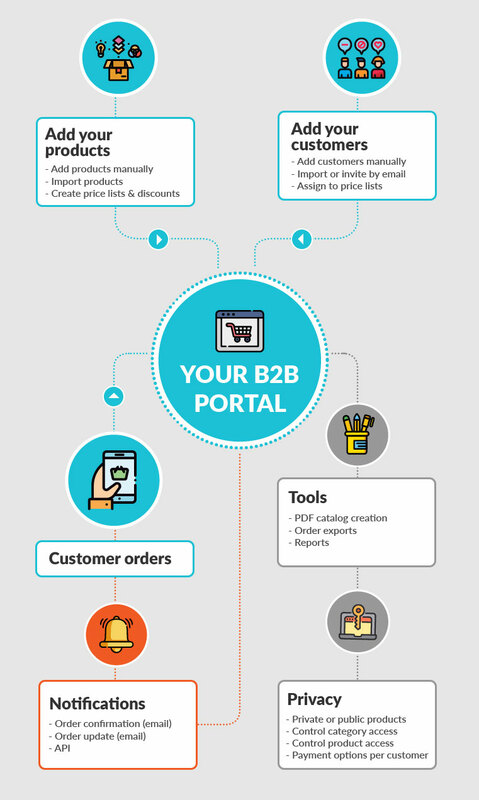 A complete B2B ordering portal where your customers login to see your product catalog, your price lists, place orders, and communicate with you. A complete rep portal where your reps can login, add new customers, manage existing ones, and add orders. The reps access is controlled by admin users. With our fast rollout and unparalleled onboarding procedure, your B2B online store can be up-and-running in less than 24 hours. Perplexed about your ROI? Our cloud-based solution costs up to 75% less than most on-premise solutions. Cut down the time you spend in taking in orders, monitoring your inventory, and processing invoices, for focusing on what really matters: expanding your business. "Easy to Use. Extremely Versatile. Super Fast. Fantastic Support!" "Our customers keep raving about it! Easy to set up and the team is helpful"
B2B Wave is a user-friendly software that allows B2B wholesale distributors and manufacturers to easily set up their ecommerce platform, accept orders online, communicate with their customers and boost their sales.